Chapter 1: What Is (And Isn’t) Genetic Genealogy? Chapter 2: How Do I Interpret My Y-DNA Results? Chapter 3: How Do I Interpret My mtDNA Results? 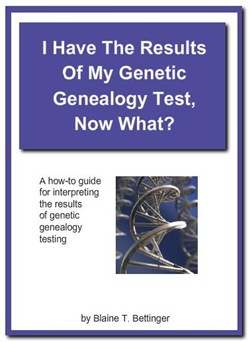 I’ve spent many hours over the past few months working on this eBook, and I hope that you find it helpful in your own genetic genealogy journey. If you find anything that might need correction, or have any suggestions for future editions, please feel free to email me. And check back often for updates to this eBook. If you find the eBook helpful, please consider subscribing to my blog for updates and future releases. Congratulations on the release of your ebook Blaine! I know it will be very popular. It’s just what is needed in the field of genetic genealogy. Thanks Jasia! I really hope people find it useful. Hi Blaine, I’ve just finished reading it. Great work! I’m going to make a quick blog post about it. Spread the word. Ricardo Vidal’s last blog post..I Have The Results of My Genetic Genealogy Test, Now What? I’m very glad that you enjoyed the eBook Ricardo! And thank you for helping to spread the word. I really think this could help a lot of people demystify genetic genealogy. Thanks for the concise, understandable prose in both e-books. I’ve read them both and I’m certain the information will be useful as I explore the new Sorenson-GeneTree offer. Craig – I’m happy that you found the eBook to be understandable, and I hope you find it useful while continuing your research! undocumented daughter of Andrew Jackson Junior. I will pay for any and all documentation. Hi, it seems like you have a good following and because of that i will give your ebook and read. Junior’s last blog post..Why Sell Information Online? I’m glad you’ve decided to read the eBook Junior, I hope you enjoy it. How do I find a living relative of Andrew Jackson, Junior, who would share their DNA data so I can prove that we are related to his aunt and stepmother Rachel Jackson the president’s wife.